Click here to read more about this linky party. And, hey! If you are new to my blog...welcome! I'd love for ya to help spread the word by adding my button to your blog and after taking take a look around, I hope you'll become a follower too! Also, I posted May's themes on my sidebar. This week is all about BOYS and BOM...whether they are a work in progress or finished BOM quilts...please do share! 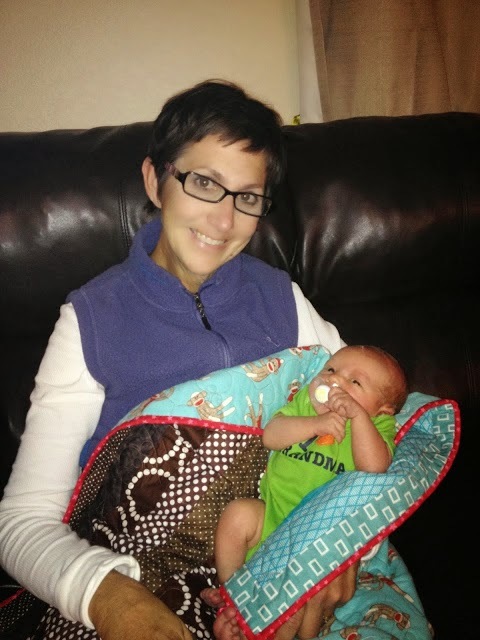 If you are a follower, you know I became a new grandma this past October. This little guy is the first "boy" in our family. I'll add my links to the few quilts I've made for him so far, but know I'm looking forward to all your "boy" posts. I can use all the inspiration you have to share! (I'm use to pink and purple!) Soo, a big thanks to ya ahead of time. This, Underground Railroad Sampler, is my first and only BOM...so far! It was the second quilt I made. 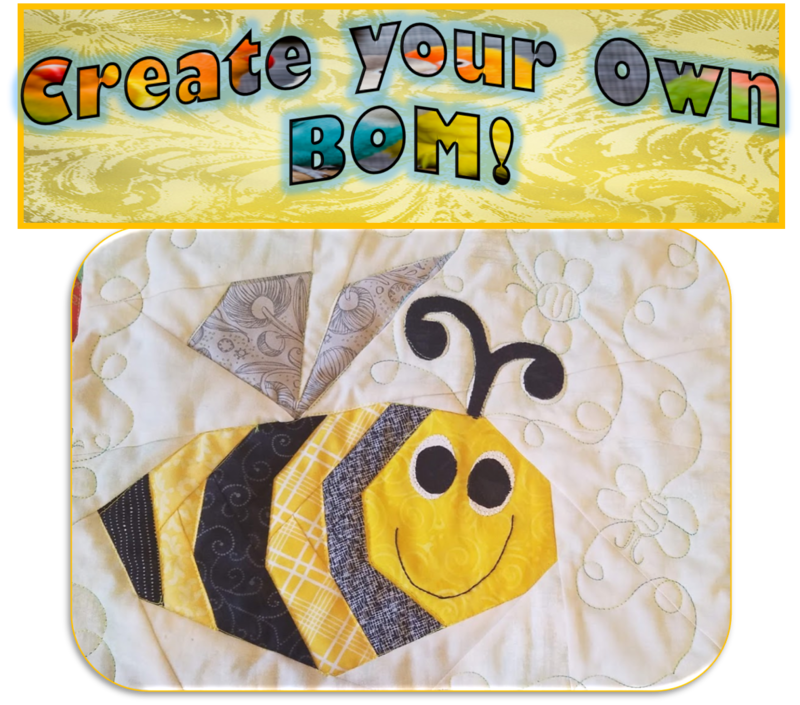 In 2009, I jumped into a Monday BOM night class with a wonderful bunch of ladies, following my Intro to Quilting class and boy, am I grateful I did! I learned sooo much about the basics of quilting. It's a queen size quilt made from the Kansas Trouble fabric line. I made it for my parents 50th Wedding Anniversary. My mom and I enjoyed picking out all the fabrics. It looks wonderful in their motor home and it makes my heart happy knowing that they have a little piece of my work with them where ever they go. Secondly, I also wanted to begin an animal/nature quilt with my Second Graders. Please stop by here and check out the fun we had. You'll also find a tutorial there that I created for any of you interested in creating a quilt like this with kids. I find myself really motivated by the ALYofF challenge this year. 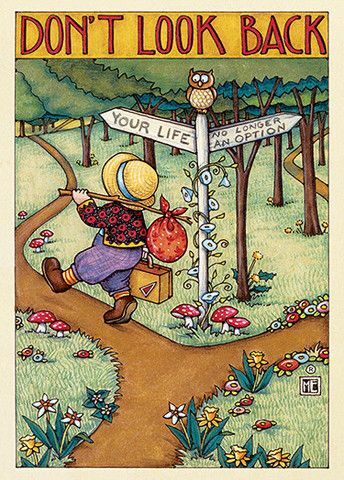 I can't believe we are at the April and May begins this week....is anyone else feeling like that?? Stop by & check out everyone's April finishes & thanks a bunch for stopping by to see mine. Oh! And tomorrow's Tuesday Archives themes are: Boys and BOM (WIP and/or finishes). I'm looking forward to to seeing what posts you find in your archives this week. I stayed with dark purples this month, knowing I can always add a light version later if wanted. This month I accented using Rik-Rac...and ended up hand stitching it on. They will certainly make a cute addition to my rainbow neighborhood though. Thanks again to Angela for the motivation. Wishing everyone a wonderful Saturday! ...all together make for a very Whimsical Flower Garden. My Whimsical Flower Garden Quilt has been so much fun to create. 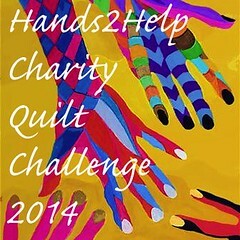 It makes my heart smile knowing it's now on it's way to be part of Sarah's H2H Charity Challenge. 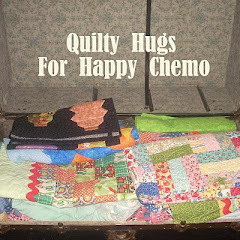 I think my Whimsical Garden will be the perfect Happy Chemo Quilty Hug don't you!? This measures 42" x 64". Depending on their age, review with them detail and scale. I was very specific with my seven year old students that we wanted to just draw one animal very well. The animal was going to be the focus of their block. I told them we were not going to add a "background/setting" to their picture. (I had examples to show them) It was also helpful to have a variety of animal books on hand for my students to browse through. As children get older and begin to draw with more detail, they actually begin to draw smaller. In this case, I just enlarged their drawing and helped them "center" and trace their enlarged drawing on a new piece of paper. I also instructed them to concentrate on the outline of their animal right now and reassured them that they would be able to add details and color to their animal picture once it was on the fabric. The final step is to have them trace their picture with a sharpie marker. This will make the picture more transparent when it's time to trace it onto the fabric. Next: Prepare the fabric squares. Cut enough 9" squares (plus a few extra) out of the white cotton fabric. Then: Iron these squares to Freezer Paper. This was a lifesaving step!! This step really helped "stabalize" the fabric and the students had no problem tracing and drawing on the fabric. Using fabric markers, have students first trace their drawing. Once their picture is traced, they can now begin coloring and adding details to their block. My Second Graders really enjoyed this project and I think your children and/or grandchildren would too. Students learned about the diversity of animals that live in our foothills and the elements that make up this habitat. On their trail walk, students looked for signs of animals, explored where different animals might live, and what they need to survive. Playing a predator/prey game of hide and seek. Students played an active game of "Hawks and Lizards" that demonstrated the effectiveness of camouflage for prey animals. Students experienced first hand good and not-so-good examples of camouflage. As a teacher I may plant the learning seeds, but it isn't until students are truly engaged through independent practice that the real learning occurs! I hope you enjoyed a peek into my life as a teacher. We're certainly having a great week in Second Grade! My monthly fat quarters arrived like a ray of sunshine in the mail! And...I also treated myself to these 1/2 yard cuts from Jane's Fabrics. This is her In The Beginnings Set. I'm thinking of ordering three more ABC panels, another yard of the blue and 2 1/2 more yards of the dots for a future ABC classroom quilt. I'm off on a field trip with my second graders today. Stop by tomorrow for a look at their animal/nature blocks they have been creating for this year's classroom quilt. They are really enjoying this project. This week is all about BIRTHDAYS and BORDERS! 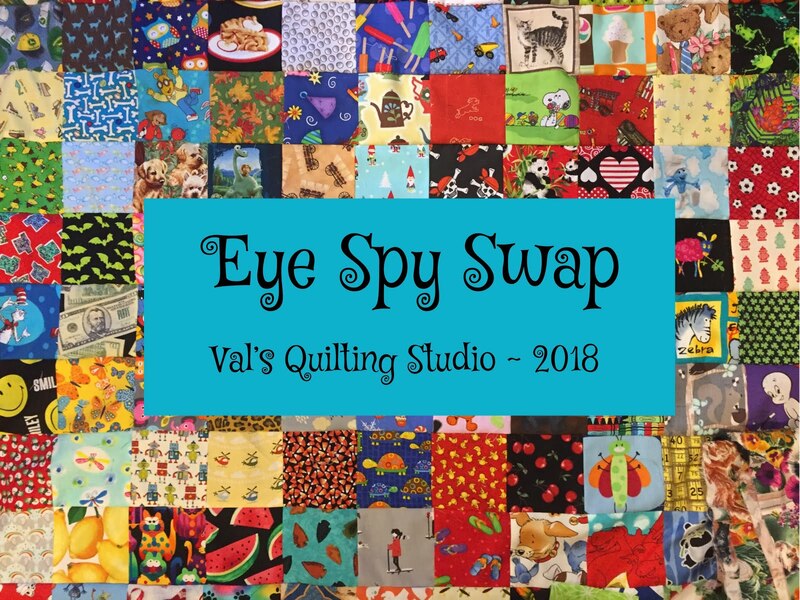 Whether it be a quilt you made to give as a birthday present, a wall hanging to celebrate birthdays, a table runner or even gifts sewn, I'm looking forward to seeing what you have to share this week!! Just a cupcake WIP I made one day while playing with fabric. This is the first quilt I quilted using my long-arm. I DO like the ABC and added Rik Rac border on this. I'm always tempted by all the puppies. Yet, by the time I get home I really can't imagine the energy of having two "Jacksons" running around the house anymore. (We've had up to three JRT's at once in the past) I'm learning in this chapter of life how to enjoy ME time without commitments and obligations outside of work. The day we brought Jackson home 4 1/2 years ago...our empty nest baby!! I'm sure he'll be around for my Triangle Friday Finish photo shoot this week! LOL! 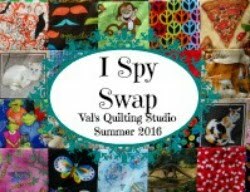 (As we all know how much he loves to be in my quilt pictures!) His breeder/groomer did tell me he needs to trim down a bit...but I reassured him so did I...Spring will find us both getting our trim waistlines back. (Winter does that sometimes. I may have spent a few too many weekends living in my flannels...LOL...but I have no regrets!) For me this means smaller meals, no sugar, wine & low carbs, more walks. For him it means smaller meals and more walks too...we got this! I hope Spring finds you rejuvenated too! We had fun making tangram bunny cards in 2nd grade today! Kinda thought it would make a really cute quilt block too! (ooohhh I just imagined making a classroom quilt made of tangrams figures.) Anyhooo... I wanted to take a second to wish everyone a blessed and happy Easter weekend. ..."someone" is not very happy with me right now! Jackson will sit on the arm of the chair and stare at me!! And that's where he stayed for the rest of the evening as I worked on the binding. My husband humorously calls us "pathetic" and I smile "I know" in return. I've had dogs all my life, but never one that I truly bonded with like my Jackson. 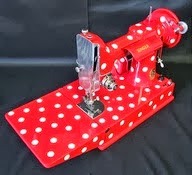 Hope your sewing is cozy too!